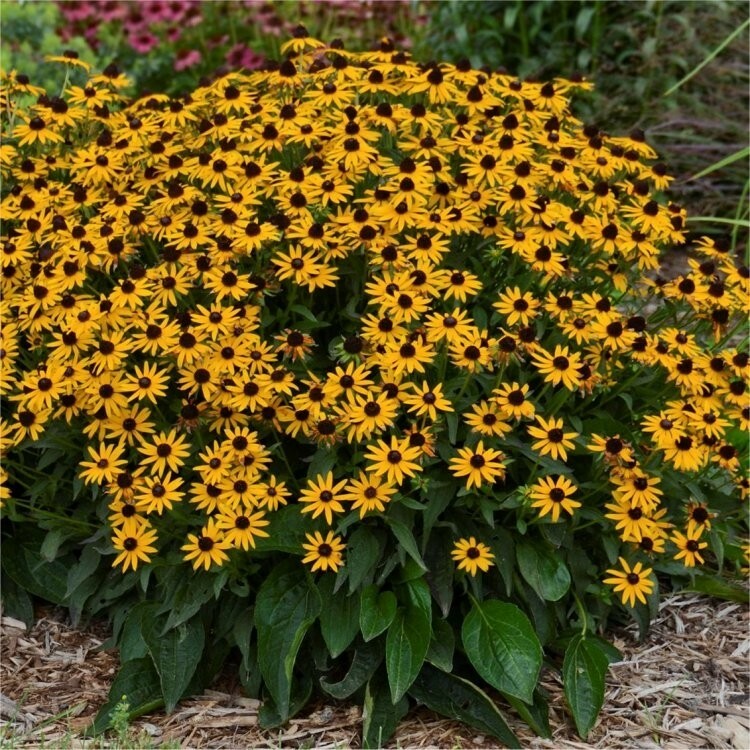 Rudbeckia fulgida Little Goldstar is a recently introduced compact form of black eyed susan cone flower - a perennial favourite. Compact in nature, Little Gold Star will put on a particularly abundant display of flowers from midsummer. The yellow daisy-like flowers appear almost luminous sitting on top of stout branching stems that rise above the bushy mounds of attractive green foliage. Reaching no higher than knee height at around 30-60cms tall it is ideal for patio planters or for prolongin the display in a mixed herbaceous border. Try at the front of Bishop of Llandaff Dahlias for a really vibrant look, or perhaps combine with other summer flowering perennial favourites such as Crocosmia that will bloom around the same time. Flowering from summer to the first frosts, Little Goldstar Rudbeckia is perfect for mass planting as the front of the border or as part of a seasonal container display. It looks fabulous mixed with other seasonal favourites such as Sedums, Ajuga, Heucheras, Dahlias and Grasses too. There are so many choices with this plant. Super quality plants full of buds and blooms in season. Supplied in approx 2-3 litre containers.